The greatest skydivers in the world are at your doorstep, ready to hold your hand as you take that leap into the realm of speed, space and freedom. Our innovative programs are designed to give you the tools and knowledge to be a safe and effective skydiver. With a positive attitude and hard work, you will earn your certification at Skydive Philadelphia and become a solo skydiver, with the ability to jump anywhere in the United States. Accelerated Freefall (AFF) is a training program for those interested in entering the exciting world of solo skydiving in a short time. The program is appropriately coined ‘accelerated’, as it is expedited in comparison to other programs. Our program, built around the USPA’s safety oriented Integrated Student Program (ISP), is fun but extensive to ensure each student is given the tools and proficiency to be a safe skydiver. Students are trained individually or in small groups to ensure materials and procedures are properly understood and followed. While the AFF program is not easy, with the right amount of commitment and passion, anyone can find themselves on the path to becoming an effective solo skydiver. We find that students are most successful when the course is taken in a timely manner, whereas large recesses between training and jumps can hinder a students performance. Although most students are able to progress through in a few days to a few weeks, others may need more time to develop the needed skills and can incur additional training and jumps costs throughout the course. Our program will provide you with the skills needed to become a skydiver through seven levels of training (A-E). 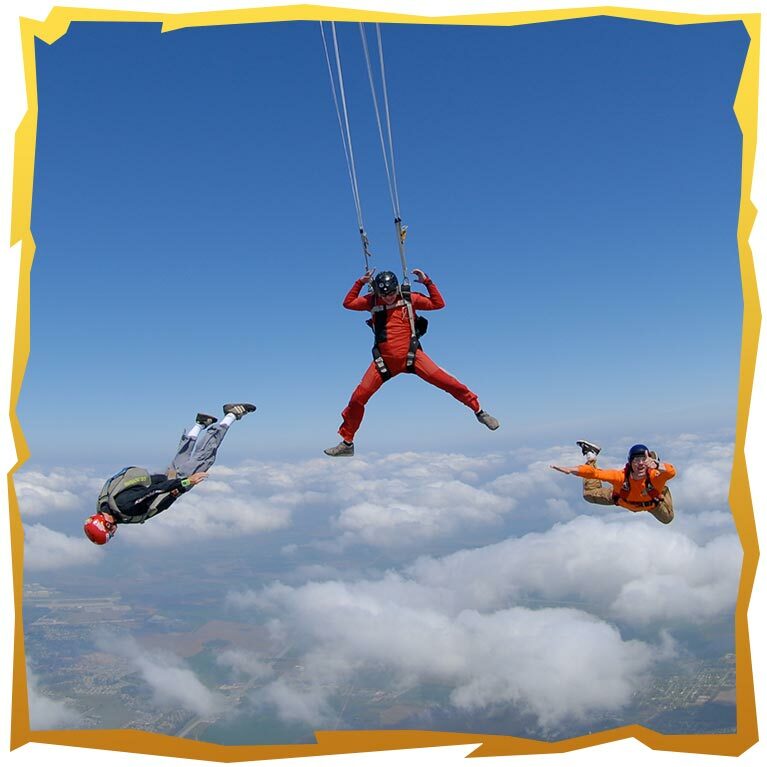 Each level consists of training on the ground and a skydive. Each jump gets more advanced as you progress, while the training beforehand lessens as you acquire the basic skills needed to build your experience as a skydiver. These 7 skydives will ultimately count toward the goal of receiving your A-License after 25 jumps. Class starts at 8 AM sharp and consists of 4-6 hours of ground training to give you the fundamentals of skydiving. To finalize the day of training, you will take a written test to show you have mastered the information taught. Upon completion of the written test, you will begin to make your journey into the world of skydiving! 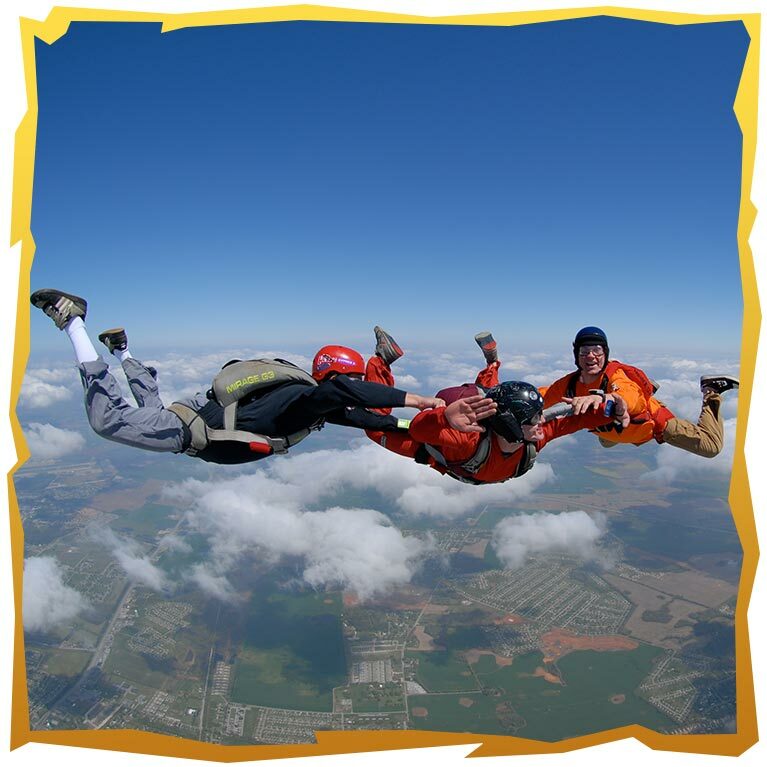 The first skydive you will complete consists of two instructors holding onto you for the entire jump, with the instructors’ aim to hone in your skills through the use of hand signals. At 6000 feet, after roughly 60 seconds spent in freefall, you will deploy your parachute, pilot your canopy to the landing area under radio guidance, all while using the skills and procedures you learned during ground training to land safely. Following your skydive, your instructors will debrief you on what you did well, and what you need to improve on. Further training will take place as you progress through the course, as you gain the needed skills to complete the program. Upon completion of our AFF program here at Skydive Philadelphia, you will be cleared to solo skydive under student status until you complete the 18 additional jumps required to receive the A-License. These jumps will be guided by, but not directly assisted by instructors, to acquire more advanced skydiving techniques. We also offer an A-License package, which includes all the necessary equipment, training, and skydives needed to gain your A-License. We know you’re ready to jump, so give us a call to get started on what will be the most thrilling and rewarding adventures of your life!